If I had young children and wanted to set aside money for their education today, I would choose a 529 Plan over a Coverdell ESA or UTMA/UGMA account. I'd also be smarter about the way I funded the account, either arranging gifts directly to an account (for grandparents, aunts, and uncles who ask what my kids want for birthday and Christmas celebrations) or placing cash gifts my kids received into an account. My opportunities for college savings in this way have passed. But I enjoyed talking with a Fidelity representative about 529 Plans and how to ask for gifts. Earnings grow free of federal income tax inside of a 529 Plan. These plans don't have significant restrictions on contributions like the Coverdell ESA (you can only contribute $2,000 per year; plus there are income caps on the givers) or quirky tax rules like UTMA/UGMA accounts (certain earnings are exempt and other tiers of earnings are taxed at the child's rate or the parent's rate). When they first came on the scene, 529 Plans seemed to have high costs and low returns. The plan designs seemed to benefit the financial service providers, not college savers. Today, though, there seem to be better choices for investing via 529 Plan accounts. Parents (or others) can save and invest within a 529 Plan sponsored by the account owner's state or certain plans sponsored by other states. For example, in my home state, I can sign up for a NC 529 Plan and then choose from various investment options that include conservative and aggressive portfolios comprised of Vanguard index funds. I could also select a 529 Plan sponsored by another state available through Fidelity, an investment firm that manages four college savings plans open to all U.S. residents. Recently, I spoke with Keith Bernhardt, vice president of college planning at Fidelity Investments about saving, investing, and paying for college; 529 Plans; and the firm's gifting program for 529 Plans. Research indicates that grandparents are aware of the challenges of saving for college. They realize that college expenses are escalating, student loans are crippling, and parents' earnings may not allow them to save as much as they'd like for their children's future. So, grandparents may be more likely to give to a college account than parents may presume. Fidelity's 2014 Grandparents and College Savings Study revealed that 90% of grandparents are willing to contribute to their grandchildren's college education rather than give traditional gifts for special occasions (like Christmas and birthday celebrations), if asked. According to its 2014 College Savings Indicator Study, only 21% of parents ask for such gifts. So, Fidelity has come up with a clever way to make this request. This firm has designed a 529 Plan gifting tool that enables parents who own a Fidelity 529 Plan account to ask for contributions. Parents can design a page featuring a child and his or her career ambitions, and then send a link to the page via email (they can also post the link on Facebook or Twitter). Givers, like grandparents or possibly aunts, uncles, and family friends, can make gifts by writing an electronic check directly to the child's college account. The dashboard allows parents to view who has made a contribution (so the parents and children can send thank-you notes) but does not share private information like 529 Plan or checking account numbers. There are other ways to facilitate such a gift. For example, grandparents might write a check to parents and let them deposit the money in the 529 Plan account, or parents could give the 529 Plan account number and mailing address to grandparents and allow them to mail a check designated for this purpose. For example, North Carolina has a page dedicated to this approach and includes downloadable gift presentations (PDFs). Fidelity's gifting service allows a direct transfer of funds without the confidentiality hassles or concerns that the cash might find another purpose besides funding a child's college education. And, the firm offers another easy way for grandparents to help fund a 529 Plan account. Rewards from its credit cards can be transferred to a college savings account; read about this approach on Fidelity's website. When's the best time in a child's life to talk about children's education with family members? Based on my experience, I'd say that grandparents get pretty excited about planning for the future soon after the baby arrives. 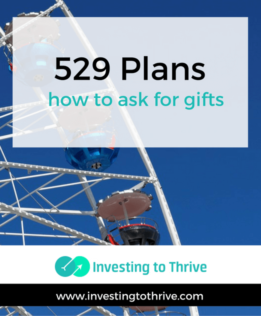 From a more practical standpoint, though, Keith points out that teenagers are already receiving cash gifts (or gift cards) for holiday presents; so a great time to suggest 529 Plan gifts may be when children are older and difficult to buy for. Grandparents may be more likely to feel comfortable giving money for college if they know there is an established college fund, whether a Coverdell or 529 Plan account and whether it's managed by Fidelity, Vanguard, or another firm. So, a first step may be to open such an account and then let family and friends know that gifts are welcome. There's no need to push, but consider making grandparents parents aware of preparations for their grandchildren's future.